The pages of history are filled with tales of fearless Portuguese explorers traversing raging seas and oceans. At Marina de Cascais, that connection with the sea continues to be recognized and celebrated. Cascais was the summer residence of King Carlos I, last king of Portugal. The King happened to be a passionate oceanographer and cultivated his interest at this marine town. He also established oceanographic laboratories at Cascais which are core to marine research in the country. Today, the Marina is equipped with over 600 mooring berths that can dock large boats. The harbour has sophisticated sailing facilities including an extended quay to hold bigger yachts and a helipad for any service and maintenance needs. Marina de Cascais hosts many sailing championships annually and has a gigantic platform for such events. Sunset at the Marina is of course a heavenly sight and in the evening, the place comes alive with the locals coming in and the discos beckoning. The world class facilities at the harbour as well as an exquisite line of shops, restaurants and bars attract sailors, tourists, royalty and celebrities from Portugal and beyond. Some of the shops and restaurants at the Marina are relatively pricey. 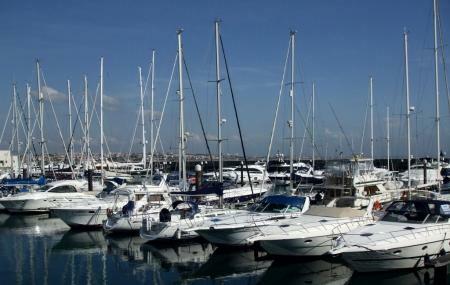 If you are looking to moor your yacht at the Marina de Cascais, the daily rate during summer months is around € 44 – 47. During off season, it will be around € 20 – 24. How popular is Marina De Cascais? People normally club together Parque Marechal Carmona and Cascais Old Town while planning their visit to Marina De Cascais. A good place to visit. Marina by the castle wall and town centre. Plenty of bars and restaurants around. Good parking spaces all around. Not far from sintra a beautiful historical area to visit at the same day. It is a calm and serene place which will relax you after a tiresome day. I like it very much. There is a small beach with a small statue nearby. Cascais is a beautiful village near Lisbon. Cascais, where this world class marina belongs it's one of the most amazing places of Portugal, not to say of the world. For sailing we can enjoy the adjacent bay and coast with perfect blue skies, usually constant wind, warm weather, good waves, beaches, everything we need for water sports and leisure, fishing spots etc. Food, wine, ambience were superb. All the more wonderful thanks to our friendly waiter Johnny. I recommend the duck!